So, maybe I've mentioned my philosophy concerning using coupons to department stores, like Kohl's, or specialty stores like Bath & Body Works. If I haven't, this is how I feel: While I want to find something that I would really enjoy, that aspect doesn't matter too much, if I can pay nothing or next to nothing, and someone in my broad circle might enjoy it. I can always give it away, to friends, family, or the thrift store, if I decide it's not what I want to keep. With that in mind, I feel pretty confident that I can quickly find something for which to use a high-value coupon. This weekend, I had a $10 off coupon for Kohl's, a free item coupon for Bath & Body Works, and two free bagel coupons for Panera (one coupon was actually my daughters, but she and I were together). It wasn't that I was needing anything from Kohl's; but I took my coupon there, anyways, while running errands, and I bee-lined for the home decor clearance section. I picked up the three hand towels, which were regularly priced at $19.99 each, but now on clearance. After coupon and taxes, I spent $4.34 for all three. 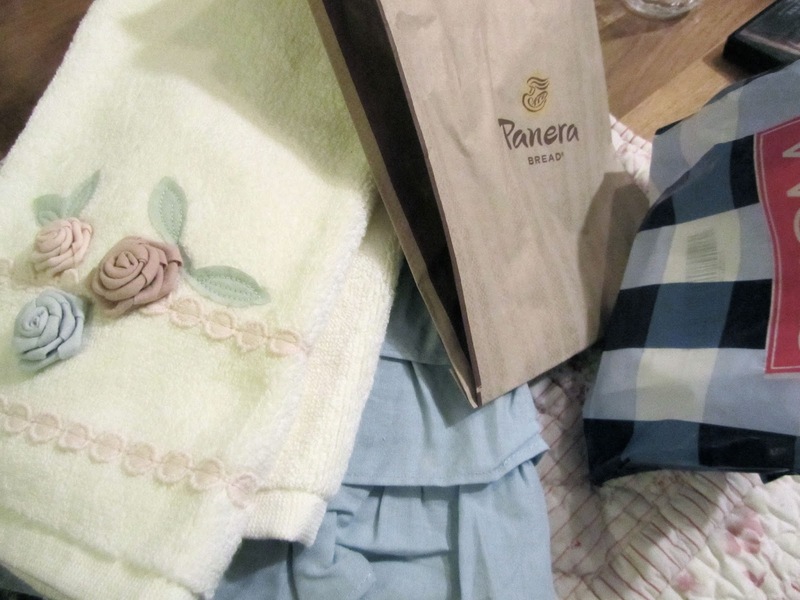 that's $60 worth of towels, for under $5. One towel will likely be a gift, the other two are saved for a future bathroom redo, coming up soon. I also wasn't needing anything at Bath & Body Works; however, as my daughters wanted to go to the mall on Saturday, to pick up a cheap umbrella at Daiso, I offered to drive. While the daughters were mall-ing, I dodged into B & BW, and chose my one free item. I chose something that will be a gift item for someone on my list. It had a $5 value, and was completely free, with coupon. After we met up again, the day felt too lovely to go back home to dig into work again, so we decided to use our two coupons for free bagels at Panera. No, I wasn't in the mood for a bagel, not a whole one at least; but free is a mighty fine price. The daughter without a coupon said she's enjoy splitting one with me, so that's what we did. Two bagels, three ladies. I chose a chocolate chip bagel, got free butter and honey, and glasses of free water. We sat outside at the tables in the sun and had a smashing afternoon with no expense, except the purchase of a $3 umbrella (for which my daughter used a gift card from an auntie at Christmas). One very swell day, with freebies for gifting, for redecorating, and for snacking. Now that's my kind of day at the mall! Sounds like a lovely afternoon--time with your daughters and some freebies, too! It was a fun afternoon, of the sort that we haven't had much, lately. What a pleasant-sounding afternoon! And mostly-free to boot! Hubby and I had a free "shopping" evening last week ourselves. After being unsuccessful in locating free or cheap wood chips for mulching, I put an ad on craiglist maybe three weeks ago. Two weeks ago, someone texting they had some we could pick up. They're about 30 minutes away, but for the price of gas there and back we get a very full pick-up load, 5 front-end loader scoops' worth, which cost $16 a scoop at the cheapest place I could find to buy them. The man who has them bought the place with this massive pile made from the tree trimmings on it and just wants them removed. It saves him money as he has to pay by the weight of the dumpster he has out there while clearing. So anyway, Tuesday was our third trip with at least one more to go. On the way home, we stopped to pick up two free wooden fence panels that hubby will use for the wood for a small fence project around my flower bed (dog keeps walking through it), as well as a free fire pit, both found on craigslist. what a bunch of wonderful freebies for your yard and garden! Wood chips can be had for free here, too, if we watch for a neighbor taking out trees. The guys who do the mulching/chipping will usually be glad to have a driveway to dump them in, so they can go on to their next job with an empty truck. It sounds like you are into the gardening season already. It's been too chilly and wet here this winter/spring. I am waiting for the nice weather to return. Have a lovely day, Cat! My husband , son and I went to the zoo yesterday with free passes. We wanted to see a new exhibit for rescued, orphaned polar bears. One daughter works for a non profit that was giving them away as they expire at the end of the month. We had an extra one which I have offered to another daughter to use . It will at least bring down the cost if she and her boyfriend go. The zoo used to have free and reduced days that I would take my children when they were little. i also used to use Air Miles to purchase family passes to this and museums in my city when my kids were younger. Have a great week! It sounds like it's off to a good start after your weekend. What a fun day! And that's a great use for airline miles, getting free admission to various locations in your community. I'll have to check and see what my airline miles can buy. Thanks for the idea. Have a wonderful day, Teresa! I never get free coupons for anything. What I have gotten is "get a free _____, when you buy a _____". Or "$10 off your next purchase of $50". I have gotten the free bagel offer at Panera but food isn't the best freebie for me or anyone in my family. But that is so neat that you were able to get so many freebies and a fun day out. We did nothing special with our son on his spring break except the grandparents' anniversary dinner. He helped me with some yard work but the rest of the time we worked while he studied. Oh, those coupons rarely get used, here, either. They sound like the "free turkey with $150 purchase" deals that pop up at Thanksgiving. I never spend that much in one swoop, so it's hard to take advantage of the deal. And now spring break is over for your son? My daughters went back to classes today. It was nice to have them around, even if they were often busy doing their own things. A day of zero spending is a good day for me, too. It is my goal to live lightly, using resources wisely and bought at the cheapest price (can't beat free). Recently, I bought two free (after promo codes) movie tickets to Power Rangers for my daughter and granddaughter to see last night. That's a savings of about $30. I learned that it was a movie our granddaughter wanted to see so the timing was perfect. Win-win as far as the promotion goes. There are many opportunities to live well for so little, but it takes conscious effort to be careful (frugal) with money. I keep track of my savings (which reminds me I still need to record the $30 saved in my savings journal). I know for a fact how much little here and there adds up. And keeping a record of the savings proves it to me, as well as motivates me to continue and always be vigil and open to more opportunities. Last week, we saved about a thousand dollars on the cost of bamboo flooring. Our bedroom carpeting is beyond old, and although we weren't looking for new flooring, a drastic clearance caught our attention. Figured it was a good time to do this project ourselves, and the beauty of DIY is we get to figure out substitutions and shortcuts that can save on any additional materials required. Hopefully our ideas will work, if not we'll figure a solution. In our years of handywork, there was never a complete disaster, always an opportunity to avert and learn. It sounds like you had your share of freebies or great deals lately, too! I bet your granddaughter was especially pleased to get to go see a movie she wanted. Will the flooring project be something you and your husband tackle right away? It sounds lovely, and will be so easy to take care of, in the future. Thank you! We had such a pleasant afternoon, with a treat, and some free or low-cost shopping. I've bee eyeing those towels at Kohl's for a while, so I was happy to see a few in the clearance section. Wow, impressive. I wonder if I'm the only one who feels uneasy about not making any kind of a purchase when I have a freebie coupon, especially at a restaurant. For instance, when my kids were younger, they would earn a free coupon apiece for a shake at a local fast food restaurant if they met their reading goal. I would always purchase something small for me (usually a small beverage) because only getting the freebies felt awkward to me. I don't have the same feelings about gift cards or the rare freebie store coupons (usually the $10 for $10 spent at Penney's, mostly because Penney's gets a fair amount of my business during the year). This may be just a quirk of mine but I was wondering what others think. I feel awkward, too, sometimes about freebie restaurant coupons, especially if it's a table service restaurant. If it's counter service then I am fine just getting my free thing. My daughters had restaurant freebies for their birthdays, and one year I went with them for a lunch out. I didn't feel comfortable just sitting there, without ordering anything and eating off of their plates, so I ordered something for myself. As a result, it cost us way more than I felt comfortable spending, just for a bowl of soup. At a fast food restaurant, though, I think they are very used to people coming in and just using the coupon for the freebie, and nothing else. They hope for more of a purchase, but I do think many people just come in for the freebie. At Panera, they didn't bat an eye over our free bagels, with no other purchase. That's a great use for the coupons! Is there a brand of nylons that Kohl's carries which you feel are long-lasting? I often receive a couple of these coupons, back to back, this time of year. I'll check their nylon/hosiery section with the next coupon. How fun to spend the whole afternoon together & hardly spend a dime! I don't know why our Kohl's is no longer sending those $10 coupons. I used to be able to get something for one of my daughters as a birthday or Christmas gift for free or nearly free. Last week I took the kids to Dairy Queen for their free ice cream cone promotion. Each child got a very nice sized chocolate soft serve cone. My son and his fiancee went out for the freebie ice cream cones last week, at DQ. I mentioned it at dinner and he quickly texted Angie to see if she'd like some ice cream. Very cheap date. Oh yes, with nice weather those date nights have a lot of possibilities. Just even sitting under the stars late at night is so pleasant in summer. You know, Penney's doesn't send me their coupons any more. I wonder if it's just a demographics thing, or they discovered I didn't spend much in their store even with a coupon. That's too bad about Kohl's not sending you their coupon. I'm sure that was very nice for picking up birthday gifts for members of your family.